Financial writers like me often use the metaphor of a roller coaster to describe the stock market. That’s especially true at times of market volatility. Take the last two years, for example. First there was that long upward ride throughout 2017. That’s the part where your roller coaster car is hauled to the top. Then came the first thrilling dip in the first quarter of 2018. The market pulled us upward again for the next two quarters. Now it seems that we’re on another upward climb! The question is: How much do these gyrations matter? Ninety-nine percent of the angst ordinary investors experience is due to their short time horizons. To eliminate that angst, just think about — and invest for — the longer term. 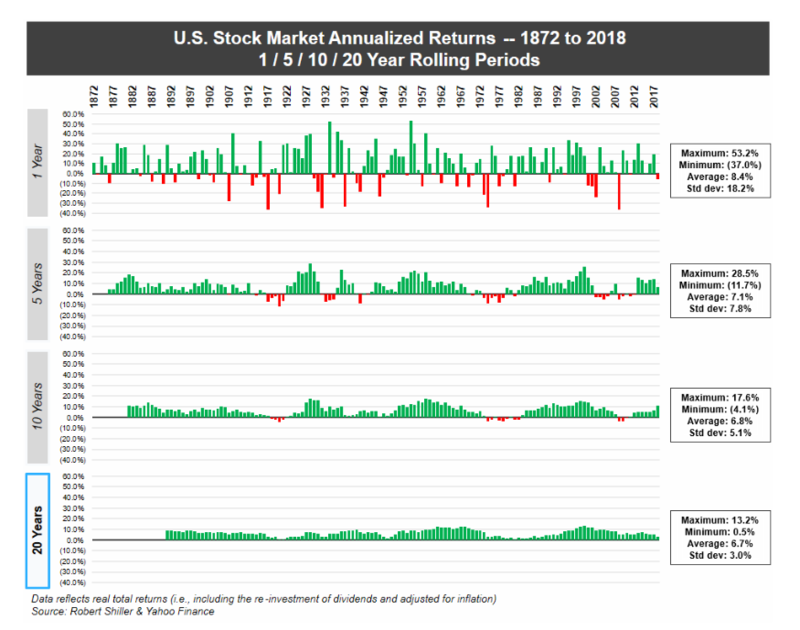 The remarkable thing about this chart is that as we lengthen the time frame over which we average market performance, we see smaller annualized gains … but the frequency and magnitude of annualized losses eventually disappears altogether. If you focus on it year-by-year, the stock market is indeed a roller coaster. 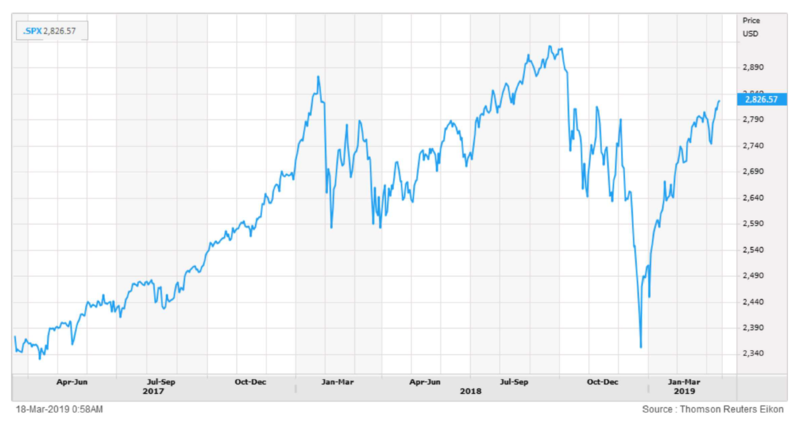 You can experience the thrilling heights of a 53.2% gain and the sickening drop of a 37% drawdown. But if you lengthen that perspective to, say, 10 years, the biggest rolling average gain you’ll see is 17.6% … and the biggest drop is only 4.1%. And the average annual gain over those two time periods only differs by 1.6% — 8.4% over a one-year timeframe versus 6.8% over a 10-year timeframe. Looking at the stock market this way is like looking at the ground with a magnifying glass and then backing away. With a magnifying glass up close, the ground looks like a bunch of mountainous rocks. But as you back away, they appear as grains of sand and soil. Eventually the ground just looks like flat terrain, with no bumps or dips at all. At the risk of mixing metaphors, regular readers may know that I’m a die-hard cricket fan. I picked up the bug during my decades in South Africa. I rarely miss a match involving the national team, the Proteas. Unlike baseball, cricket batsmen keep batting for runs until they get out. On average, good players score around 40 to 45 runs every time they bat. But that average conceals a wide range of scores. A player may go through a period where they’re scoring 50 or even 100 runs an inning. But then they inevitably experience lean patches where they’re getting out for only a few runs. The secret to being a good cricket batsman is not to worry about the ups and downs, but to focus on performance over time. Sure, it hurts to see a string of small scores … but a talented player knows that he will eventually return to form. The same principle applies to investing. Don’t panic over year-to-year ups and downs. Pick good investments and stick with them over time. Don’t focus on the daily stock market news. Either set alerts to let you know when your investments have reached a critical threshold, or rely on something like my Bauman Letter to do it for you. You see, whether we’re talking about roller-coaster rides, sporting performance or investing, the principle is the same. You’re going to experience ups and downs along the way. But in the end, if you don’t do anything foolish — like jumping out of the roller coaster car as it begins to descend — you will reach your goal. Editor’s Note: Ted’s commentary was recently featured in Barron’s. You can read it here.